Shameless plug aside it was great to see lots of entries this month, and they weren't all brownies. Bundt cakes are brilliant - they can be any recipe as the name comes from the ring-shaped tin which I believe originates from Germany. 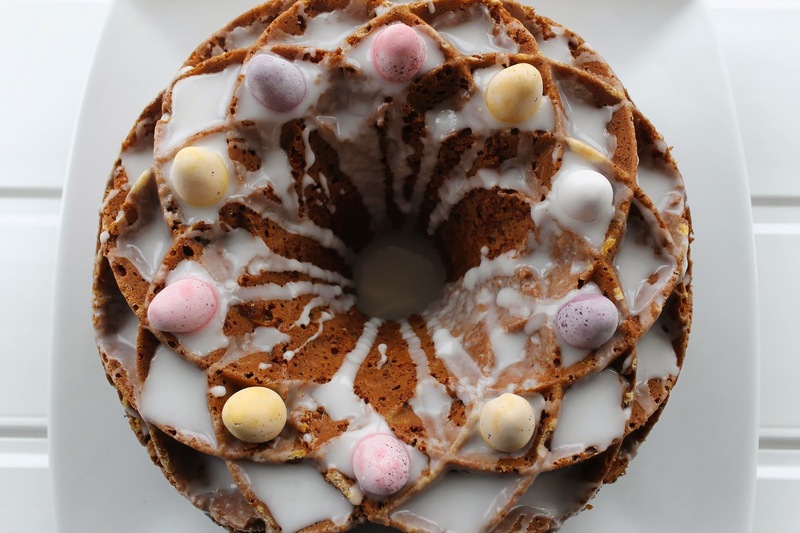 Ness at JibberJabberUK had some bananas to use up and created her own recipe, adding carrots, dried fruit and spices, and decorated the cake with mini eggs. A great cake for Easter or any time! 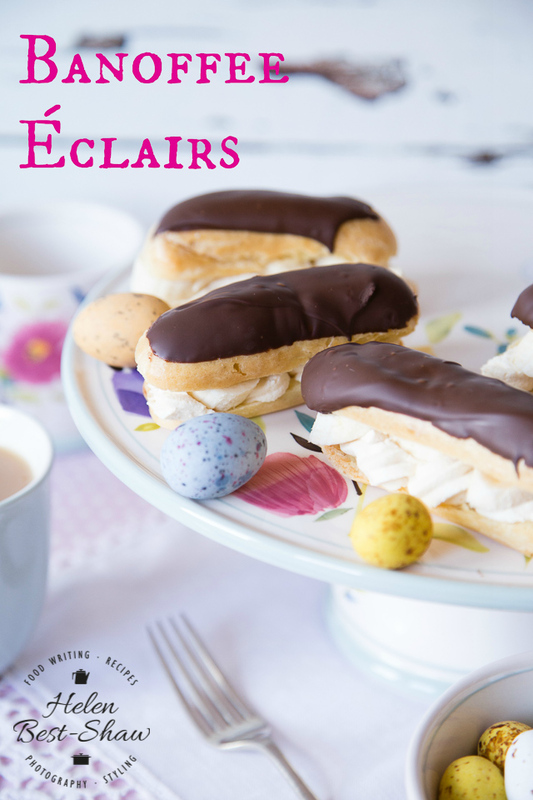 These banoffee eclairs from Helen at Fuss Free Flavours are a creative twist on a traditional bake. She added some dulce de leche to the whipped cream and used bananas in the filling, and they are beautifully decorated - much neater than the eclairs I've made before! The photograph is so good too. 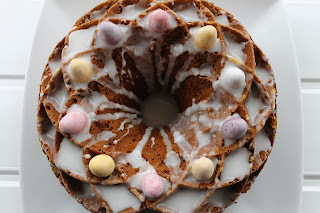 Another bundt decorated with mini eggs - which seems to have been a trend this Easter! 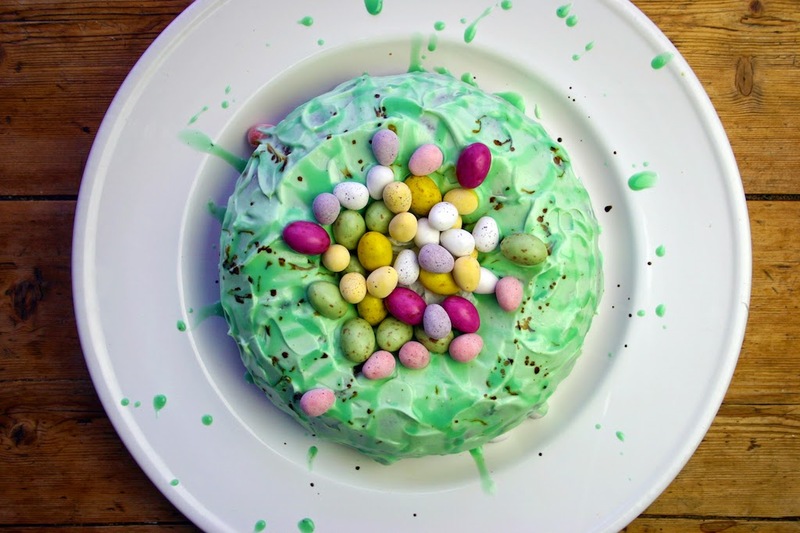 This pretty speckled egg white chocolate bundt comes from Dominic at Belleau Kitchen. He says the lemon zest stops the cake from being too sweet and it's very easy to make, which is the beauty of bundts as they don't even have to be filled. My Alphabakes co-host Ros at The More Than Occasional Baker made these 'cinnabunnies' for Easter, using ready-made cinnamon bun dough and arranging them in the shape of rabbits. Aren't they cute? 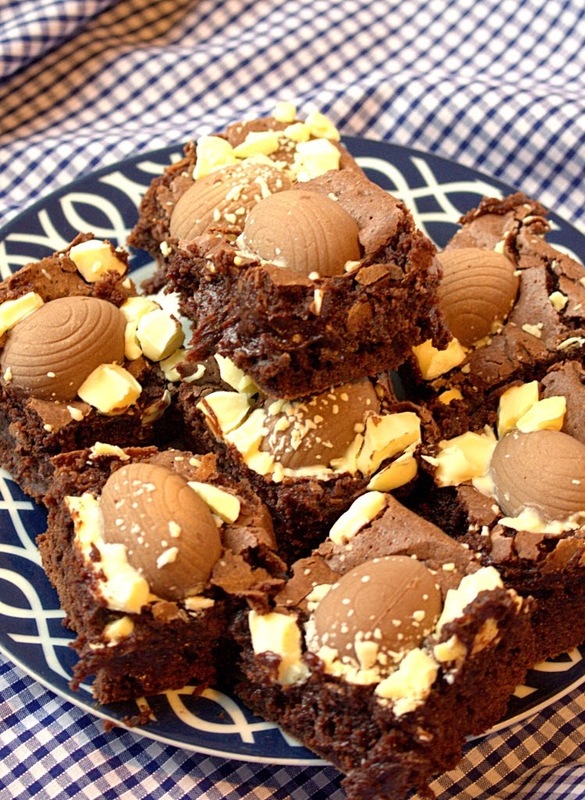 Laura at I'd Much Rather Bake Than made these amazing brownies with mini Galaxy Caramel eggs - some of my favourite chocolate. She made these to celebrate getting accepted to do a PhD - congratulations! Don't these look amazing? Bananas also inspired Stuart at Cakeyboi who made these banana maple nut waffles. He has a new waffle iron but his secret is toasting the waffles after they have come out of the machine - I might have to try that! More buns, this time from Jen's Food. These are flavoured with saffron and glazed with a lemon icing and look really spring-like so perfect for this time of year. She says they have a soft and light texture similar to brioche. Jas at All That's Jas sent us this wonderful Easter bunny cake that is a lot of fun and almost looks too good to eat - but I'm sure I could! She says she has a family tradition of making something bunny-related at Easter which is a nice idea. Jas also made these banana upside-down mini cakes, a quick and easy favourite where she always has the ingredients at hand. I'm curious to know if other people have go-to recipes like this? 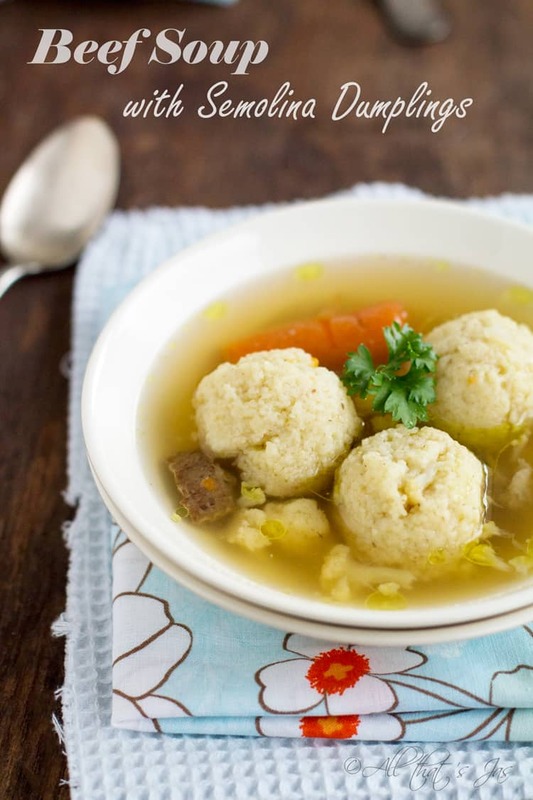 That's not all from Jas - she also sent in this beef soup with semolina dumplings. It's nice to have a savoury recipe for Alphabakes and one that is so beautifully presented. It looks like it might take a while to make but I think it would be worth it! Ros from the More Than Occasional Baker is back with these banana and berry lemon muffins - a flavour combination I wouldn't have guessed worked, but clearly it does! They look very colourful and pretty I think. 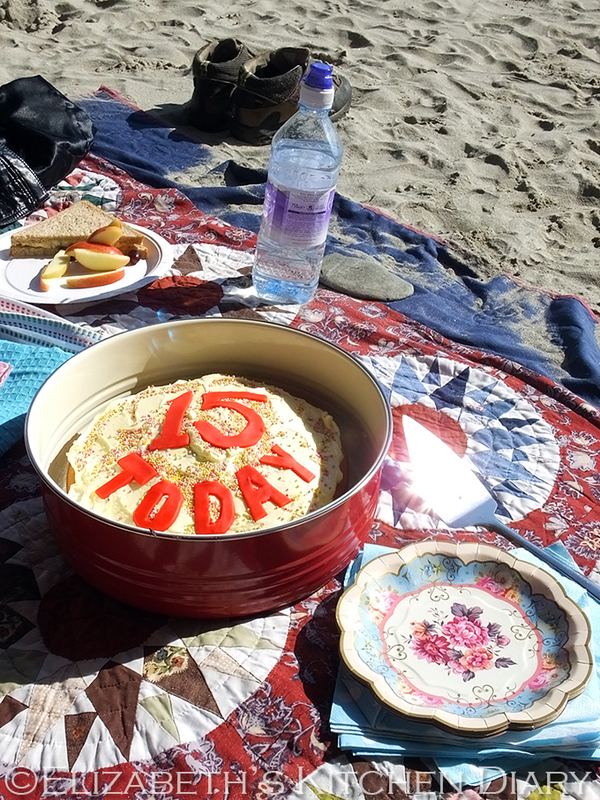 B is for buttermilk birthday cake, in this post from Elizabeth at Elizabeth's Kitchen Diary and I urge you to read her account of treasure hunting on St Ninian's Isle and how the birthday cake was served in a cave! Some more brownies, this time from Suelle at Mainly Baking; she made brownies with hazelnut praline crust and I think the crunch of the crust would contrast really well with the softness of the brownies. My mum sent in three B cakes this month - a blueberry sponge, chocolate brownies and a very pretty blue iced bundt. She must have been baking up a storm! 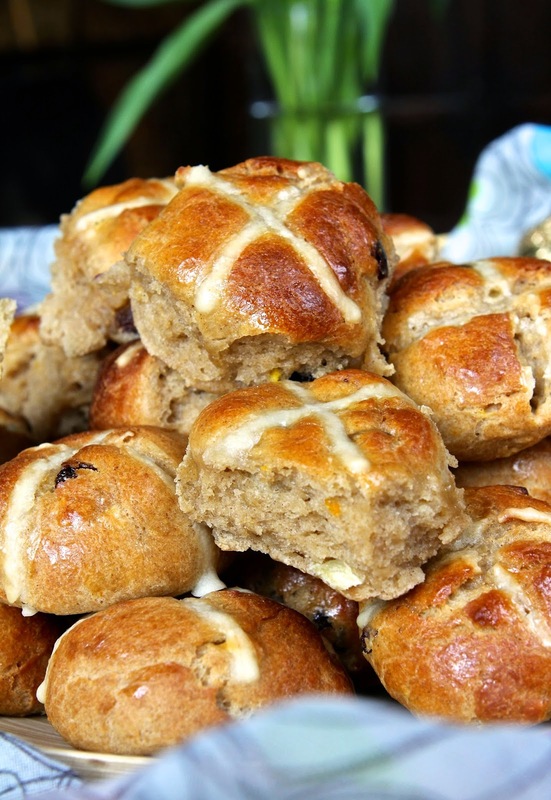 These hot cross buns from Kate aka The Gluten Free Alchemist look really good, and the flavour - apple, cherry and sultana is an unusual twist. She ate them with homemade lemon curd so look out for that recipe on her blog too! Kerene, the Dream Baker, made these mini cheesecakes with blueberry compote which she says is a recipe that just can't go wrong - sounds good to me! They would be perfect for afternoon tea or a summer party. Jean at Baking in Franglais used a chocolate brownie mixture as a base for a cake in this sticky pear and chocolate brownie cake. She was baking at a friend's house while her kitchen is being finished which she has unfortunately had a few problems with - hope you have your lovely new kitchen soon, Jean! When I saw the title 'buns' in this post I thought Kerene at The Dream Baker had made iced buns - but in fact she produced these chicken curry buns. A bit like a spicy chicken pie, these have bread dough instead of pastry and look very enticing! You can never have too many brownie recipes... these chocolate and pecan brownies come from Kat the Baking Explorer, who was using up store cupboard ingredients before moving to a new flat. Hope the move went well! I think Lisa at United Cakedom may have coined a new word - bruffins! These are brioche muffins with white chocolate chips and dried fruit and look delicious. I've never made brandy snaps before but Alexandra, aka the Lass in the Apron, makes it look so easy I might have to try! These are filled with a brandy-spiked cream and look amazing. I made this lemon cake for a baby shower - so I am slightly cheekily entering it in Alphabakes as a baby cake - which I decorated with a teddy bear and a bow I made on a cake decorating course. The cake was really light and moist and lemony. My Alphabakes co-host Ros at the More Than Occasional Baker has really been busy baking this month, and sent in these banana, cashew butter and chocolate chip muffins. She made these to try out a new protein supplement and says they are great for breakfast. The last entry this month is another one from me: caramel-filled chocolate brownies. I got the idea from the Comic Relief Great British Bake Off and I can assure you these taste amazing! oooh, such a scrummy B round up... all those bundt cakes!